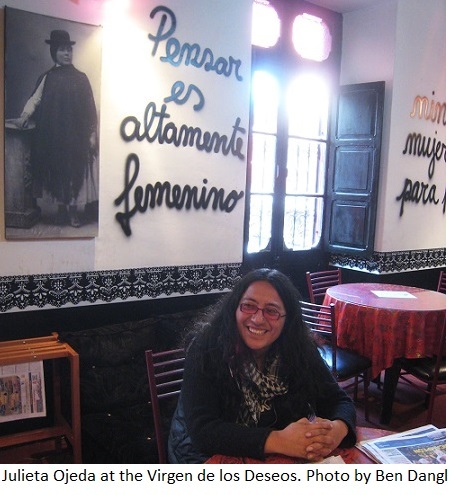 Julieta Ojeda is a part of Mujeres Creando, an anarchist/feminist organization in Bolivia that has been a radical voice for women’s rights before and throughout Evo Morales’ time in office. 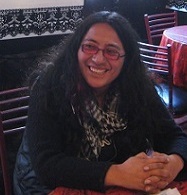 We interviewed her in La Paz in the midst of various social protests against the Movement Toward Socialism (MAS) government. Benjamin Dangl & April Howard: What do the current conflicts in the country, particularly the one surrounding the TIPNIS, say about the politics of the MAS government toward indigenous people? Julieta Ojeda: In principle Evo is a symbol of an indigenous man who has come to power, has taken the powerful role of president, and with the very fact of his being indigenous one assumes he would defend the indigenous. But the relation he’s assumed with the thirty-four different indigenous nationalities reveal that he isn’t a man who identifies with this image. They say he’s indigenous, right? And yes, he is, but he identifies primarily with the cocaleros [coca farmers]. 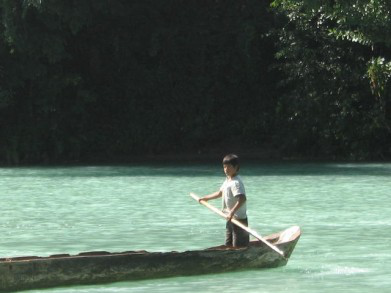 In one sense he’s not indigenous but a cocalero, and he responds to that sector. And there’s another issue. [Under the MAS] there are first [class] indigenous and indigenous of the second [class]. And another issue is that of Aymara-centrism and the indigenous people who have value in this government are in the west and not the others, those of the lowlands. It has been made clear to us that [Evo] isn’t going to be a man who respects nature, that is, who respects “Pachamama” as he’s proposed in his discourse. His government has a developmentalist project, a bad developmentalist project if you will, because the lowland indigenous people have their own forms of rational exploitation, or sustainable management of their resources. […] There is a vision of development, but a development that doesn’t destroy nature. And the government of Evo Morales is completely with the other vision. BD & AH: How is the MAS co-opting social movements in order to maintain and extend its own political power? JO: The MAS has penetrated certain organizations and divided them. They enter these social movement spaces and create divisions by forming their own parallel organizations. This is a common social movement or opposition group practice; the MAS didn’t invent it. The difference now is that those in the government occupy another space on the political stage. They are no longer a social movement but they continue functioning like a union, or a movement, and continue working at this level of wanting to infiltrate organizations and divide them. For example, the divisions created in the indigenous movement from the lowlands [were produced by the MAS]. They did this after the eighth march [against the highway through TIPNIS], as it was ending. There had been unity up to then; obviously there were disagreements and all, but they’d preferred to put their differences aside to show unity. But starting with the ending of the eighth march, [MAS] began to co-opt the leaders and the communities inside of the lowland organizations. It’s the same thing they do with other social conflicts, such as the recent one with the doctors, when they signed an agreement with the health administrators but not with the doctors. So it becomes a long struggle, already at least two months of conflict. They sign an agreement with one sector, and not with the other; it’s what they do with the miners, and what they do in regional conflicts, creating factions opposed to those who are moving mobilizations forward. So this is a permanent practice of the MAS to generate parallel groups to oppose the others. BD & AH: In the current political climate, how do you see the role of Mujeres Creando and the impact of its work? JO: We’ve managed to consolidate spaces, like this house itself, a space in this house, and also a certain degree of social legitimacy and political relevance. That’s to say, Mujeres Creando has a place and a space within society, but that’s also very relative. Because it’s true for some things and not for others. We’ve always been opening a space in radio, and also very persistent in our political project. Nevertheless, we’ve also publicly taken a position with respect to the policies of Evo Morales, in the case of TIPNIS and the eighth march, which we joined and supported with all our resources. And so we’ve been very critical of certain leaders and in defense of this territory and against the proposed highway that would cross that territory, because that’s playing with the future. And we’ve also criticized the machismo of the president on various occasions, the machismo of the government in its various manifestations. For instance, the attempts to organize the Miss Universe pageant here in Bolivia—and all this we do not with writing letters but rather in public actions. We’re trying to generate a broader, more open debate [on abortion]. The Church is opposed and it’s brought out all its weapons to bring discussion to an end. In this case the government of Evo Morales has been very lukewarm. This is a very conservative government as far as gay rights and abortion or anything having to do with women or women’s rights. They talk about what they’ve done, like the mother’s bonus, an allowance for mothers, but you have to be a mother to get it. So once again it reinforces the idea that women are only of value as mothers. This government doesn’t really see us as an enemy, but rather we’re like a little rock in the shoe, a constant irritation. But neither have they decided to do anything to us, because when the government decides that someone is an enemy, it’s terribly vengeful; with dissidents they try to bury them politically. But we’re just a little rock in the shoe, and we don’t really focus too much on the government’s policies since we have our own political project, and that’s only part of what we do. April Howard teaches Latin American history at SUNY Plattsburgh.